Designers are more powerful than they think they are, says D&AD's Steve Vranakis. I recently chaired D&AD's Black Pencil judging, where some of the most talented creatives in the world put forward their suggestions for this most coveted creative award. 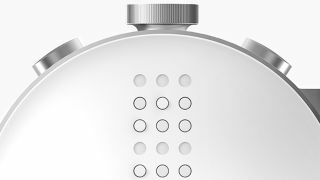 One Black Pencil winner was the Dot Watch – the world's first Braille smartwatch. Conceived in South Korea and developed in Germany by agency Serviceplan, it helps connect millions of blind and visually impaired people to the internet. It's an incredibly insightful and thoughtful proposition for the over 285 million affected people worldwide. This didn't come from a multinational medical corporation. This came from a start-up and a creative agency collaborating. Separately, I did a talk at the D&AD festival where I spoke about a mobile site that my team recently built to help keep refugees fleeing civil war in Syria safe. We tapped into Google's Translate, Maps and Hangouts products to make a fast-loading site that was easily accessible from the islands where they landed. It's gone on to help over 100,000 people. My talk revolved around the idea of 'creative activism' and the thought that we, the creative community, are more powerful than we think we are. It's something I've believed in for a long time, but have only recently had validated first-hand. Designers have natural problem-solving skills that combine with our storytelling and creative capabilities to become an incredibly powerful offering. One that can be used to solve real world problems alongside all the other things we do. At the beginning of my career, I believed that a designer's domain was very much around the world of aesthetic and communications, but I couldn't have been more wrong. When I started to see that many of the injustices and the disadvantaged around me were not being aided or acknowledged through the conventional and expected channels, I did what a designer does. With a healthy dose of naïvety and a pinch of self-proclaimed invincibility, I took it upon myself to try to help out where I could. From my early days in Vancouver designing rave flyers to my most recent projects in London helping refugees, I quickly realised that the role of a designer was much more important than the role I had filled at the start of my career. It is not only our role to help shape and – dare I say – define culture, but to also help in the fair and ethical application, and in the democratic running of it. No, really, I honestly and genuinely believe this. We as designers are best positioned to tackle some of the world's biggest problems. Not just for awards and glory, but for the good of humanity. Because the world really needs us right now. As designers, our constant dissatisfaction with the status quo, and our never-ending pursuit to make things look and work better, has meant that we've been forced to step outside the traditional realms of our discipline. We've been thrown into the wider world of helping to impact things around the globe. Economically, socially, culturally and even in education, the internet has allowed us to scale up our abilities to flex our creativity. We can make meaningful contributions across some of the most important things that make the world turn. We continue to grow through our love of learning. We innovate by always outstepping our immediate remit and applying our design thinking and approaches to things well outside of what would traditionally be considered design. Because of this, things like the information on our government websites is easier to navigate, displaced people have access to vital content and the blind now have a Braille-based smartwatch. This is the power of design and the importance of our never-ending pursuit for perfection and solutions. We are designers, and we are never satisfied and always looking to improve upon… well, everything. The world needs more people like us – more malcontents with a desire to make things better for everyone. This article originally appeared in Computer Arts issue 267. Buy it here!